Cracker Barrel offers a rustic, country style setting where families can enjoy a meal together. Each restaurant is decorated with real American artifacts, memorabilia and signage and contains the Cracker Barrel store, which sells unique country home decorations, knickknacks, toys, music, DVD’s and much more. Start the day off right at Cracker Barrel with a choice of the restaurant’s delicious breakfast combinations, including a Country Fried Breakfast, Smokehouse Breakfast, Morning Sampler, and the Old Timer’s Breakfast. Other breakfast options include pancakes, french toast, eggs, bacon, sausage, cereal, fruit, yogurt, muffins, and more. Lunch and dinner options include Sandwich Platters like the Chicken BLT, a Meatloaf Dinner, steaks, fish, the BLT salad, and the Cracker Barrel Specialties like the Smoked Country Sausage n’ Biscuits and the Beans and Greens. A kids menu is available, offering breakfast, lunch and dinner options like cereal and milk, chicken tenderloin, grilled cheese and a hamburger. The dessert menu includes the Pineapple Upside-Down Cake, Double Chocolate Fudge Coca-Cola Cake and Frozen Mug Sundaes. The Cracker Barrel Store and Restaurant is open Sunday through Thursday from 6 AM until 10 PM and on Friday and Saturdays from 6 AM until 11 PM. 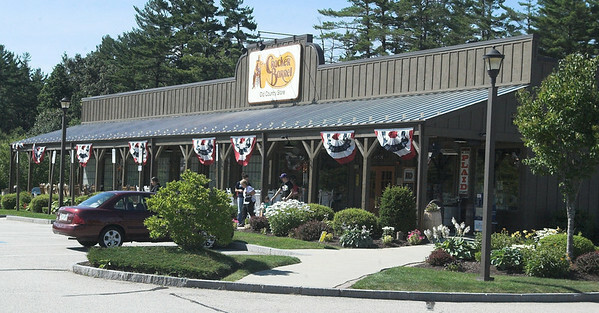 Visit Cracker Barrel online or at 16 Nashua Road.